This entry was posted on September 18, 2017 by Jessica Anderson. Planning a chili cook off? Whether at your work, your church, or at home with family and friends, hosting a cook off can be a daunting task, believe me, I know. Every year we host a chili cookoff for our group of college friends and we even did a chili cook-off for our holiday party here at Trophies2Go one year! Below I've shared my favorite tricks I've learned from hosting chili cook-offs. I hope they help you with planning your competition. It starts with a little preparation ahead of time and then having the right tools at the event. Make it easy by serving in crock pots. 1. Serve Chili In Crockpots. 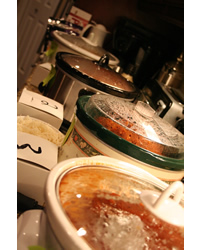 Have your contestants bring their chili entry in a crock pot, then plug in the pot to reheat. You can use cute numbers to label each entry so that it's a blind tasting. 2. Extension cords. It's helpful to have a couple of extension cords handy in case you don’t have enough power outlets. Also, with all of the crock pots plugged in, be aware of blowing a fuse. We haven't had this problem at our events, but it's good to have a plan just in case. 3. Dish Up The Chili For Your Judges. In my experience, it gets quite busy in the kitchen, with guests or judges dishing up their chili and everyone milling around. My solution is to create a plate of numbered taster cups and dish up the entries ahead of time (see below). 4. Use Taster Cups. Before guests arrive, I prepare my "taster cups". I tape small plastic or paper cups onto a paper plate with the entry number written in sharpie on each cup. At the event, I fill each taster cup with the correct entry, leaving a spot in the middle of the plate for a palate cleanser, such as crackers, cornbread, or corn chips. 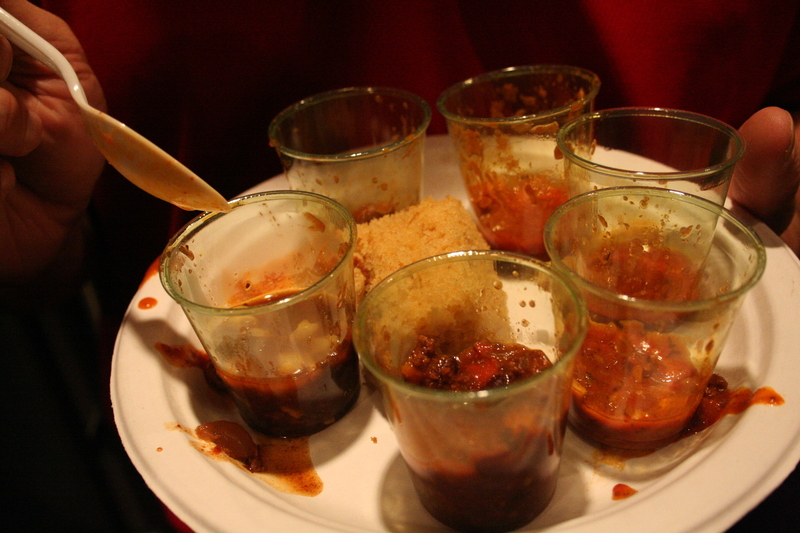 Small tasting cups attached to paper plates are a great way to serve chili for judging. Also, be sure to judge the chili with the correct accompaniments. For example, if the chef wants cheese added to the top of his/her chili, by all means add it when filling the cups. After filling with chili, I hand out the plates to the judges. This not only eliminates chaos in the kitchen, but it also disguises whos chili is whos. After judging is over, everyone can go back for a bowl (or two) of their favorite. 5. Have Enough Serving Utensils. Each chili entry needs its own ladle and spoon. Ladles work great to dish up bowls of chili, but are too big to fill taster cups. Instead use a smaller teaspoon for that task. 6. Create An Easy Way to Judge. For our cookoff, we give each person 2 poker chips. They have 2 votes for their favorite chili. Adults get one color of chip, the kids get a different color. Then votes are counted and prizes are awarded. I've also seen score sheets used. They can be found online at Chica and Jo's website. 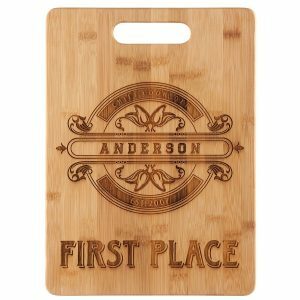 An engraved cutting board makes the perfect prize for your chili champ! 7. Ad Hype With Prizes and Awards. That’s where we come in! We offer chili cook off awards in every price range, from blue ribbons to engraved cutting boards. Browse the chili section of our website to see all the choices. My favorite is the Annual Chili Cook-Off Trophy; that's what I will give the winners at our chili cookoff later this month. 8. Don't Forget The Decorations! This is what adds the extra touch to your competition. Ideas for chili cookoff decorations include chili peppers, stock pots and southwestern themed décor. Having an occasion to decorate for is always fun too - such as hosting on a football game day or someone's birthday. Check out our Trophies2Go Chili Cookoff pinterest page for even more ideas! I hope these 8 tips help you plan the perfect event. Feel free to share what worked for you, or if you have other ideas, add them below. Wishing you a wonderful chili cook-off! Editor's Note: This post was originally published on October 10, 2014. It has been updated for content.